The Our Changing World lecture series explores contemporary global challenges, and academia’s role in tackling these issues. The series, which has been running at the University of Edinburgh since 2010, is an opportunity for staff, students, and members of the public to learn about the research the University is undertaking, and the impact that it is having on the wider world. Academics have addressed a wide range of topics this year, including climate change, genetically engineering livestock, the future of travel, Scotland’s historic relationship with Europe, and our salt-saturated society. The lecture series culminates in the annual ‘Enlightenment Lecture’, which this year was delivered by Quentin Cooper, the science radio broadcaster best known for his BBC series ‘Material World’. In his lecture, Quentin challenged the traditional perception of the scientist in contemporary culture. The lecture began with the results of a recent study in which participants were asked to select their favourite on-screen scientist. The most popular answer was Dr Bunsen Honeydew from the popular show, ‘The Muppets’, highlighting the inherent problem that scientists are not easy to relate to, so much so that the favourite TV science personality is not even human. In his witty talk, Quentin outlined the particularly popular perceptions of scientists widely portrayed in films and classical literature: the mad scientist, the loner, strange, old genius hidden away in his lab surrounded by mysterious, bubbling concoctions. Not only are they negatively portrayed as distinctly bizarre, but as geniuses, which Cooper notes is the core problem. The definition of scientists as geniuses makes their achievements seem remote and unachievable, and as a science as a career option seem unreachable for the next generations. In addition to this, the majority of people asked think of scientists as old and male, which isn’t encouraging for aspiring young women interested in science. Quentin explained that a recent study found that just 15 per cent of 10-14 year olds wanted to be a scientist in later life. In his talk, Quentin touched on the famous image of Albert Einstein, the ‘genius’ responsible for the theory of relativity. Rather than portraying his discovery as that of a respected intellectual, the media still use the image of him poking his tongue at a camera. 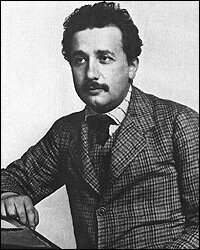 This, we were reminded, was in fact a much later picture of Einstein. Photos of him at the time of his discovery do not conform to the image of a ‘mad scientist’. Yet his image has since been defined and shaped by the picture of an older scientist behaving strangely in a fleeting moment. It is from this, that countless films (Back to the Future) and books (Dr Jekyll and Mr Hyde) have further reinforced this image of the mad scientist. The extent to which this is engrained in society is further highlighted by a survey which asked people who their favourite TV science presenter was. Over half were unable to think of a single name. For Quentin, people struggled to define the likes of Brian Cox as science presenters purely because they didn’t conform to the stereotypical image of the scientist. Fortunately, progress is being made. Hollywood’s role in the creation of the ‘mad scientist’ is beginning to be challenged, with young, female, and approachable scientists appearing in films such as Gravity. Perceptions are changing, but Quentin emphasised that there was still room to improve. In order for science to be more accessible and fascinating for future generations we need to reject the current stereotype images in the media.